During the last couple of weeks I was able to observe a couple of playtesters going through the current version of area 4. Luckily, this time the area miniboss isn't as unbalanced as Arachnus and Torizo were in their earlier versions. In fact, quite the oposite happened with the overall battle difficulty with normal enemies. Samus has access to Plasma Beam and the Screw Attack in this area, like in the original. After getting these Samus is pretty much invincible, and enemies need to be very tricky or have annoying traits to pose at least some challenge. I even added a new, original enemy. But I can't seem to find a middle ground between it being cheap and just being a moving target. So, there's the posibility of moving one of those major items to be found on area 5. This might require the redesign of some rooms, and more testing. By this time, in the original game, once you cleared the tower and chose your beam, you went directly to the Omega nest. It made sense to be fully prepared by that time. Now, this is where I need to depart the most from the original level design, specifically with item placement. In the meantime, Area 5 was redesigned from the ground up. It will have some unique events, like all the other areas do. The layout is on paper right now, and it will need to house the item moved from Area 4 too. But I was able to give the existing rooms a new location and functionality, so production of this area won't take that much, level design wise. Things are going a bit slow, but any progress is good. hola, me llamo marvin y queria preguntarte si aras una version de este juego para psp cuando ya lo tengas completado. I haven't played through all of the original Metroid 2, so I don't really know about the bosses. Maybe you can give them more armored areas and make the weak spot hard to hit? Just an idea, but whatever you choose, I'm sure it will work out great! Keep up the good work, I am anxiously awaiting a chance to test the next areas. I've already cleared everything to be done in the current build and confrontation. A little bit of variation from the original is always welcome, some of the additions in the other areas were very welcome surprises. I have tried using some USB controllers I own but to no avail. Is there a specific controller I should be using? Didn't played original as well, yet I can't wait to play it! After playing demo I really want to play final version. Good job!! Genial, ojalá salga pronto una demo del sector 4 :D Está quedando magnífico el juego, que no se modifique nada en lo anterior, está ya perfecto, haría bien enfatizarse en avanzar que es lo importante en lugar de retro-analizar. Recuerde dar un espacio al "jingle" retro que tiene Metroid 2 original, quedaría excelente. Siempre siguiendo el proyecto, un saludo desde Chile. Esta quedando extremadamente bien este remake, pero te quería preguntar si podrías agregar filtros gráficos al juego. Game Maker Studio si no me equivoco soporta filtros gráficos como el Bilineal, 2xsai o HQ2x y eso haría que los sprites del juego se vean mejor (mas que nada en monitores grandes). If you ever need some feedback, advice, or ideas on making things appropriately challenging, you can have my input. I'm not afraid to tear something apart and make it right. I don't like to give design-related comments on principle (I do not want to influence the planned design), but you should note that due to the overall M2 mechanics Screw Attack was in a way "weaker" than in Super Metroid while Plasma was merely a choice beam. Given the beam combos mechanics you have and that it's much easier to (re)design enemies around a projectile, and that Plasma in itself could be rebalanced the same way it wasn't almighty in Fusion, I'd suggest it be Screw Attack what is relocated (since its point is to esentially trivialize minor encounters) and it is thematically fitting with Fusion giving it in the depths of SRX. Of course, I'm looking forward to see the differences in Area 4 either way (given how particular the original area was) as well as the enemies in there. The way you seem to have the game now, the animal enemies appear to be largely moving targets and the robotic enemies are the ones which are tricky. I very much enjoyed the challenge posed by the robots in Area 3. They felt appropriate for the level of skills Samus had obtained by that point. While you're reluctant to be cheap, the only effective defense the robotic enemies could hope to have against a screw-attack wielding Samus would be projectile weaponry as they negate the screw attack. You're absolutely right, Doc: any amount of progress is better than no progress. It sounds like you've managed to avoid getting sick with flus and such, so that's even better. I wish you guys good luck and keep up the spirit for the goods. Man, I'm getting giddy thinking about the finished project. No only will this be a complete metroid game, but it will be the only new metroid game, fan made or professional in 5 years. I think seeing this might rekindle both metroid fans enthusiasm and Nintendos trust in metroid. Good luck and keep up the good work man. Maybe the boss should be a dragon type thing (somewhat like Ridley, but not entirely). but its what i use to play and i have no problems! been following you since i first heard of it. cant wait for the final release. ive played the original on game boy and pretty much every other metroid game from the first release of metroid on NES, all the way to the prime series. i think you have potential to make a classic even better. only tried a couple of your demos, and i think i will await the final release of the game when it is finished. dont want to spoil anything. (lol). as always keep up the great work and look forward to next months' update. Oh, and I forgot to mention yesterday. Regarding the plasma beam. Each upgrade in previous areas made it easier to deal with the robots (the main tough enemies). In the area with the plasma beam upgrade, the new robots in the area could be initially only vulnerable to missiles or charged shots, making you want to avoid them rather than using your limited missile supply or risk getting hit charging up your weapon. But Samus would discover that they are vulnerable to the plasma beam she has just picked up, and by extension screw attack (since the fully charged gun creates a mock screw attack). That might balance out the weapon a bit. You could also make the new SR388 animals found in that area vulnerable only to missiles at first but have Samus discover they can be brought down with the plasma beam. You could do that with some current and missing enemies too like the hard-shelled creatures in Area 3 and the side-armored creature that hasn't appeared yet. The plasma beam could cut through their armor. I was browsing through Metroid 2 videos. Then I found someone who was able to complete the game without spiderball or spacejump. The Screw Attack is traditionally the last item you get in the game (for obvious reasons) so in my opinion it kind of makes sense to make it the only item in area 6 or something of that nature. Otherwise it might become difficult to do level design around a player potentially getting it before say, the gravity suit or something like that. Don't have to do it, but it's just a thought coming from a long time veteran of the series. I'm in with the plasma and screw comments XD If any ítem should appear on Area 5, I think it might be Screw attack. Plasma is an upgrade we all are expecting (as well as Power Bombs. Where are you gonna put all the expansions if they're all at the end? ), and the possibility of making enemies only vulnerable to plasma is also cool. Keep up with the great work! If anything, a way to have Plasma not broken is to play with differences in its piercing abilities and other proyectiles. One enemy I would design would be, for instance... have those plants that spawn bugs spawn a lot of them. The bugs would shield the plant from missile attacks by sheer numbers, but beam weapons being rapid-fired wouldn't hurt the actual enemy. This would integrate Plasma very well, since you'd use it to much more easily dispose of the bugs to finish it off with a missile. I've been playing through AM2R and I wanted to leave some words of encouragement. This game is really great. Thank you for putting all this work into it. I'm really enjoying it and I have no complaints at all. I think I'd probably say, if you're going to have the other missing Federation team to be found deep past Area 4, let them take one of the upgrades. That way you may not have to worry about light enemy balance all that much around The Tower. I check up on this blog at least once a week to see how the progress is going. To see the care and dedication you're putting into the game gives me high hopes for the eventual final product. Take your time, you've already built a legacy. I'm one of those that has played the original. I think everyone should before playing a remake. So sadly I'm gonna sound like a stick in the mud. But I'll try to do it in a fair manner. Here goes. I think you should keep to the original as much as possible I do like the extra bosses and other boss alterations. But relocating items fully out of their areas in my book is a big no, no. I might sound a bit childish here but I just wish to speak from the side of the original creators. Well to a degree. The thing is that I enjoy a few variations like the mining tools. They are very well done. I will make a suggestion such as to ask if you'd redesign the Federal Galactic Marines base camp area. I feel it's not as detailed as the rest of the game. 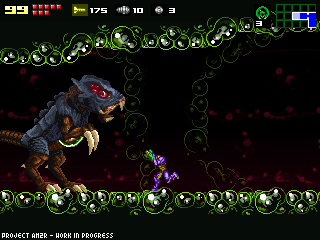 Maybe add some sprites from Metroid fusion, reworks from Super Metroid. After all there is a perfectly good dead FG soldier sprite before Kraids area. I'm not bashing on who ever did it I'm sure they tried hard. I'm not being sarcastic here either. But it kind of clashes with the rest of the games to simplistic. I also think the game is hard enough as is and the screw attack and plasma beam in their spots is just fine. I mean since you can't even attack any of the metroids with anything but missiles they're hard enough. And the idea of getting the screw attack and plasma beam in Metroid games at least in my opinion is to have an item that does make you feel a bit over powered. They are items made to breeze through enemies. I'm not trying to detour creative thought. I did enjoy the water drain area and those pipes puzzles and the big double fan you made along with the moving platforms. But I'm of a mind set that I really wanted to download your work cause it was the original game but with new graphics and color. Something that I wish Nintendo would do with the actual Metroid II game. I know the Zero Mission has alterations also but it's only rather minor in comparison. At least in my mind. And I'm talking about From the start of that game to Mother Brain not the extra level as much as I love it. But in all honesty I think you should stick to the formula a bit more or maybe if you'd be willing. I know this would be asking a lot. But perhaps an alternate version of the game where it's very much like the original just in level design and item placement and strength? I do love all the hard work you put into everything else. Like Samus's details like her movements and bored stance where she plays with her arm cannon, or the after glow that the morph ball and has. As well as the after glow/image that follows her as she jumps. And the biggest improvement by far is the item selection screen brought back from Meetroid games Super Metroid and up. And the ability to stack beams is wonderful! In those areas I do commend your and your cohorts work. Truly amazing in those areas. Love it even the changed Save Stations. As a redesign and as a weapon refill station. I wish to ask will the latest update feed into the version 1.34 I have upgrading it? Take your time doc. I'm really excited to see what you come up with for Areas 4 and 5. I can understand about not wanting it to be too easy but at the same time you don't want it to be too hard. Hopefully you find a happy medium soon. Until then, I'll be waiting for the next version of the beta. Progress is awsome and yes thank you for you work and Time as Always. Do you lose all your progress once it updates again? ive been following this for just short of 3 years now. i still have a copy of the original and its well worn. i can beat the entire game in 1:36. all i need is a good challenge. youre doing an excellent job and ive been checking back often for the demos. i want those zetas to chill my bones when i run into one. keep up the good work. if you need an extra playtester ill volunteer. happy late new year and stay safe. and i would be happy to help. I'm with this guy. If you ever need feedback from your audience then I think most of us are willing to participate in testing the demo. Sorry if I requested this post twice. I played your current demo. I've never played Metroid 2, so I'm not sure if these things are similar to it, but I've found a few things with the game that don't match the other 2D metroid games I've played. One being you can bomb jump while in the water, it's not as easy but in the originals, every time you used the bomb, you wouldn't even move. The other being that when you jump from walls while having the high jump, you jump the same height as you are off of the ground. In the other games, you jump the same as if you didn't have the boots after jumping off of a wall. I'm not sure if this was intended or not, just giving a heads up. A few other things I'd like to mention. You start with I think 30 missiles, and there are missile upgrades all over the place that are easy to get and require no backtracking at all. this makes the bosses a LOT easier than I would think they should be. I'd prefer to start with 5, or even none. I would also like to mention that in the Metroid games I have played, the enemies usually use some sort of attack that generates rubble or some other thing you can attack to recharge missiles while in the middle of the fight. The metroids certainly don't do that and they appear to be minibosses with no means of escape in some situations. I think if you cut down on the early missile upgrades and give them some way to recharge in the fight, things could be slightly more difficult. A few other things I've noticed is that there don't seem to be many hidden rooms. I've bombed all over the place, and while I'm missing 5% in items, most of the power ups were blatantly obvious and easy to get. There were plenty of nice places where some shinespark maneuvers could have been used, and the spiderball was useful for only one powerup that I remember, maybe 2. You should put some bombable ceilings where you have to use the spiderball to bomb them, and then climb up into another room with it or something. I was also wondering if maybe there could be an option to make spiderball where instead of pressing down when you touch a wall/ceiling/etc, you could press against the wall and it would morph into the spiderball. There've been quite a few times where I would have liked to spiderball back onto a wall and would forget I had to press down. Also, another thing. If the screw attack makes an entrance, could you possibly adjust it's use to make it so it isn't so completely overpowered? I was thinking maybe make it like an upgrade for the "charge screw attack" where you only do a screw attack if your beam is fully charged, and it only breaks if you hit an enemy, much like the original charged screw attack, however it has that extra range and damage to back it up. It wouldn't completely kill the screw attack, but it'd make it so that you couldn't just destroy everything with absolutely no problem, as you'd need to recharge your beam. I think these suggestions would help create a better difficulty without making it game breakingly hard. Btw I also think there is a music problem in the areas around the boss for the spring jump. Can't describe it well, just suggesting you check it out. Um, most of what I wanted to post has already been said so just a slight suggestion here. I think your overall design is well executed and after reading your post about considering where to place the Screw Attack, (I'm not really fussed about the plasma beam or power bombs since I think the plasma beam will be placed correctly in area 4 and power bombs to me are simply a tool for navigating the map and very rarely used in a combat sense). The screw attack should be placed right at the end, in the original, before you begin to encounter the larval Metroids again the game offered you the chance to recollect the ice beam, which of course you need at this stage in the game in order to progress. However since you will have already provided 2 opportunities to collect the ice beam and have implemented the beam combo system I feel as though a 3rd pick up would be irrelevant and it should in fact be the screw attack. My argument for this is that having the screw attack making Samus almost indestructible will take out a lot of the challenge dealing with omega metroids where I think with the larval metroids it will help an awful lot in keeping them off Samus initially. I hope you find this suggestion helpful, I think this would be the best result. If I play the demo and finish it, when you update it (or finish the game) do I have to play the entire game again? It seems like I remember there being an extras area in the main menu in the first few demos. If there was, how come it was removed? Can't wait for the final Version! Finished the demo ver 1.34 and oooooooo boy. I think this is the best metroid fan-made game i've seen; the music, the enemies, the atmosphere, everything is just beautiful. keep up with the good work :). PS: Sorry if my english is a bit "poor" but is not my first lenguage. But seriously, I don't think DoctorM64 takes time off to look at all of our posts, even if we offer good information and things. My hypothesis shall be correct if he doesn't reply to any of our posts. Also several rather specific suggestions and bugfixes have been implemented. He just doesn't take time off to reply. I just finished my first play-through of this amazing demo. I am absolutely blown away by how good this is. Metroid II was good, but the lack of a map was frustrating for me, so that's all I really wanted in a remake (aside from updated graphics). Then I found your site. Keep up the amazing work and I can't way to be able to finish the game! Thank you for carrying on the love of Metroid! I just wanted to drop in and say.. THANK YOU SO MUCH FOR DOING THIS! I tried the demo, and it is excellent! It really feels like an official Metroid game, and the atmosphere is amazing. I played until the breeding grounds, as I don't want to spoil the game before it's done, but my god, this is so good. I think it would be great if front sprites of Samus (you know, when starting the game, saving...) looked so badass as scrolling ones. She shows many reactions and most of her sprites are incredibly detailed, but when she "looks at the camera", it seems too much like the Gravity Suit in Zero Mission: too many lights, but blurry and "constrained by her shoulders", you know. It's true her size respect to screen size probably don't give many space to imagination as SNES (SM Samus was soooooo awesome), but I think those sprites probably could look at least as good as the rest :) Keep up, this is a masterpiece! I love your remake ;D! There are a few things I would like changed, and only a few. All generic game maker sprites replaced with custom ones, namely the charge sprites. Larger energy tank icons, the current ones are pretty small. The game made more like the original, completely re-designed rooms bug me.